Last week I showed you my favorite method for grilling corn. This week? Let’s throw in some zucchini and a tangy sun-dried tomato dressing and call it a salad, shall we? This recipe is for all of my grilled vegetable lovers out there. It’s simple to make – just grill veggies and blend dressing (literally) – and requires just 30 minutes from start to finish. Roasted chickpeas are an optional add-in for extra protein and fiber to take this from side dish to entrée with virtually no extra time and little effort. Just roast them while your corn is grilling. Garbanzos for the win! Think zesty sun-dried tomatoes blended with fresh lemon juice, basil, olive oil, garlic, and a touch of maple and salt and pepper for flavor balance. Super creamy, flavorful, and perfect on top of these smoky grilled vegetables. This is the perfect side dish for BBQs and dinner parties, especially in the summertime. Bring your veggies and grill them on the spot to wow your friends. They’ll be so impressed with your grilling/salad/delicious dressing skills. Make it an entrée with roasted chickpeas, or throw in some cooked pasta to keep things easy (like this recipe). If you give this recipe a try, let us know how it goes! Leave a comment, rate it, and tag a picture #minimalistbaker on Instagram! We’d love to see your salad in action. Cheers, friends! 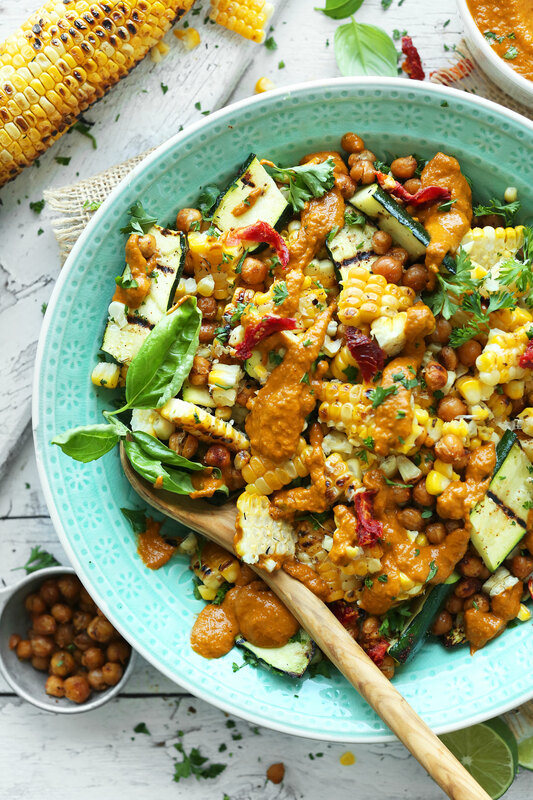 An amazing, light summer dish: 30-minute Grilled Zucchini & Corn Salad with sun-dried tomato vinaigrette! 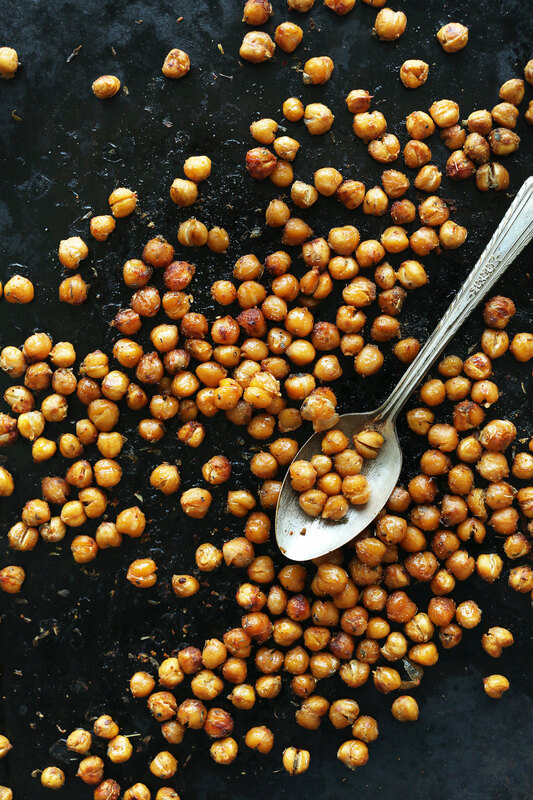 Top with roasted chickpeas for even more protein. 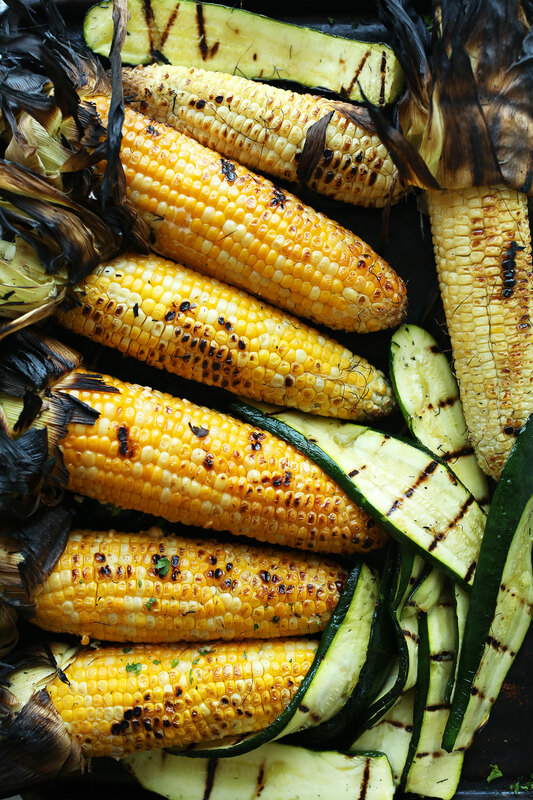 Start by heating up your grill and prepping the corn and zucchini. Slice zucchini thinly lengthwise, brush lightly with avocado or grape seed oil (or another high-heat oil), and sprinkle with salt and pepper. Set aside. Also soak corn (in husk) in cold water for 5 minutes. 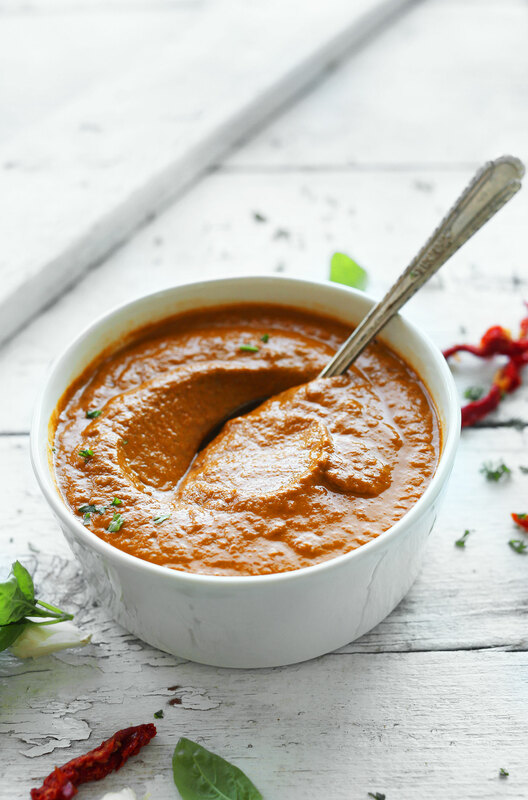 In the meantime, prepare your dressing by adding all ingredients (sun-dried tomatoes, hot water, lemon juice, basil, garlic, olive oil, maple syrup, salt, and pepper) to a blender and blend on high until creamy and smooth. If too thick, add more water to thin until pourable (see photo). Taste and adjust flavor as needed, adding more lemon for acidity, garlic for zing, maple syrup for sweetness, salt + pepper for flavor balance, or basil for freshness/earthiness. Set aside. Once your grill is hot, add corn (still in husk) and cover. Cook for 5-8 minutes, rotating to cook all sides, until all sides are lightly browned. Then carefully remove husk and place back on grill until golden brown on all sides - about 5-8 minutes. When the corn is almost ready, add zucchini to the grill and grill on each side for about 2-4 minutes, depending on how hot the grill is. You want grill marks, but you don't want the zucchini to get too soft. Set aside. Cut corn off cob and halve zucchini. Then add to a serving bowl. At this time, add roasted chickpeas if desired (see notes for preparation). Drizzle with fresh lime juice and desired amount of dressing, and garnish with fresh basil and/or parsley. Best when fresh. Leftover dressing will keep covered in the refrigerator up to 4 days. *I use sun-dried tomatoes that are dry in a package (from Trader Joe's). If yours come packed in oil, you will likely need much less water, so start with 1/4 cup (60 ml // amount as original recipe is written // adjust if altering batch size) and work your way up from there. *To make roasted chickpeas (amount as original recipe is written // adjust if altering batch size), thoroughly drain a 15-ounce can of chickpeas and add to a mixing bowl. Then add 1 Tbsp olive or grape seed oil, a healthy pinch each sea salt, ground cumin, dried oregano, smoked paprika, and black pepper. Roast at 350 degrees F (176 C) for 20-25 minutes or until golden brown and crispy. *Nutrition information is a rough estimate calculated using 2 zucchini, 6 ears of corn, and all of the dressing per 4 servings. *You will have plenty of leftover dressing, which will last for about 4-5 days in the refrigerator. Use on salads, grilled veggies, and more! Delicious! The sun dried tomato sauce is so yummy, another great recipe! Yay! We are glad to hear that, Megan! I made this recipe tonight and it was delicious…like all of your recipes that I’ve tried! I can’t wait to put the vinaigrette on EVERYTHING/ANYTHING! I used smoked sundried tomatoes, which added a nice hint of smokiness. I made this last night and it was wonderful! I added purple, red-skin and yukon gold fingerling potatoes (first blanched, then oiled, salted and grilled), as well as grilled red bell pepper. I followed the recipe for the dressing exactly and it was incredible! This is a total keeper to enhance summery garden-fresh produce and herbs. Yum! That sounds delicious, Erin! 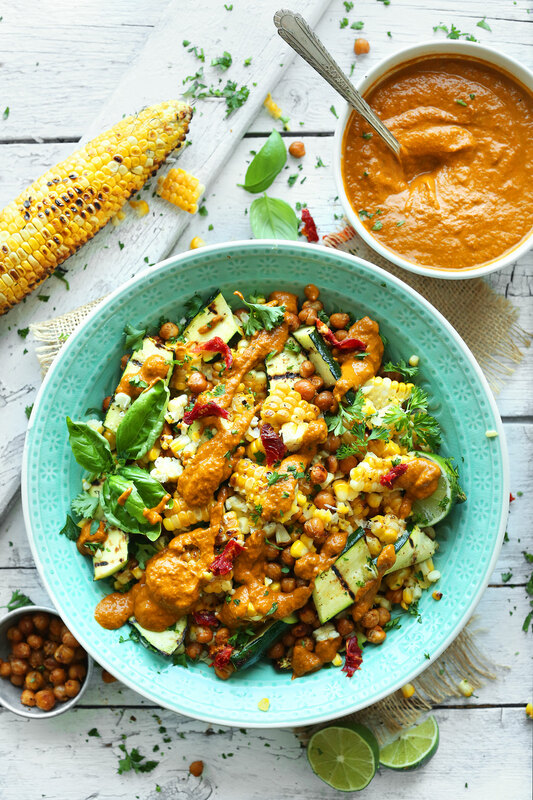 The dressing complemented the zucchini and corn nicely! I used probably 1/3 parsley, 2/3 basil for the herbs, and it turned out very well (though definitely more green in color than the pictures). We ate it with baby kale and half the corn. Yay! Glad to hear it, Karling! I made this recipe with a few veggie variations but am such a fan! Specifically the tomato vinaigrette was ridiculously delicious and versatile. I’ve actually used the leftovers as a pasta sauce and it’s worked out really really well. I will continue to make this recipe but make the dressing in bigger quantities to freeze because it’s just too delicious. Thanks for this recipe! Another delicious recipe!! I love love love this sauce and will definitely be trying it on other things, but it paired perfectly with the corn and zucchini! I did swap agave for maple syrup. I made this tonight but put a “Mexican” spin on it. Subbed in cilantro for the herbs and the sun dried tomatoes for some dried chiles, a little tomato paste and a handful of cashews. Added some black beans to the mix and it was AMAZING. Thanks for the summer salad inspo!! I made this for dinner tonight (although it’s pretty cold here in Australia at the moment) and it went down a treat! I added capsicum (bell pepper), avocado and haloumi, and even T-Rex (my meat eating husband) thought it was so good that he had seconds AND asked if he could take any leftovers for lunch tomorrow. A definite win for the plants tonight! I made this just now – that dressing is out of this world!!!!!!!!!!!! I used a mandolin and my zucchini is super thin, but I dont care..it is DELICIOUS. Adding in fresh sliced tomatoes and greens. Will eat this all week as there’s enough dressing to keep this going!!! Tomorrow I’ll slice the zucchini by hand I think. Super good – thank you!! This recipe is delicious. Made it last summer and looking forward to making this summer. Question: could I freeze the dressing/sauce if I wanted to prep that ahead of time? I love this recipe but my dressing did not come out red! It had a great flavor and everything about the meal was wonderful but am I the only one who got a dark greet pesto???? I made this! The vinaigrette was so good! Thank you so much Dana! I generally like the recipes I’ve tried from this blog, but this salad just didn’t make it for me. The dressing seemed a bit “muddy” and was not a palatable mix of ingredients. Made this as a side dish to some veggies burgers and it was AMAZING! I made it for my boyfriend and I, which meant we had lots of leftovers. It keeps in the fridge for a few days and actually tastes just as good (if not better) as a cold salad. Thank you!! I see a wrap in my future and a good excuse (like I need one) to make flatbread. .. on the grill and why couldn’t I wrap those chickpeas in foil and roast those suckers on the grill ? Thank you for sharing this one. I’m invariably searching for additional attention-grabbing ways that to cook squash since I tend to urge inundated with all promptly middle summer. Could you sub fresh tomatoes instead of the sun dried? Amazing! created this for dinner tonight and even my carnivore members of the family cherished it. I subbed honey for the syrup and value-added some sliced rainbow chard! i want to make this for christmas but i’m feeding lots of people so i’d like to add more salad ingredients. I am thinking baby spinach and red capsicum but not sure what else, any suggestions? I made this tonight as I had some left over corn and zucchini I wanted to use. It was amazingly delicious! The sun dried tomato dressing over the grilled veg was delightful. My kids devoured it too. Thank you for all your great dairy free recipes. I can’t wait to try more! WOW! This might be my favorite savory dish I’ve made on here…so so good! I dont have a grill so I boiled the corn and sautéed the zukes but it still tasted amazing. the dressing is so unreal! I roasted chickpeas too (duh) and added avocado. yum!! I used honey instead of maple syrup. I’m brand new to vegan eating ( one month in) and this recipe is absolutely, incredibly, fantastically delicious!!! I will be making this again and again while summer corn and zucchini are plentiful. Looking forward to trying many more of your recipes. Thank you for sharing. this was delicious!! I roasted the corn and chickpeas in the oven as I don’t have a grill, and sauteed zucchini, mushroom and peppers with onions, garlic, chillies and herbs and it turned out SO good! healthy, filling and the sun dried tomato dressing was insanely good. Will definitely be making this again, thanks Dana! Amazing! Made this for dinner tonight and even my carnivore family members loved it. I subbed honey for the maple syrup and added some chopped rainbow chard! Just made this using an indoor grill pan. That dressing is delicious and the grilled veggies were perfect. I put everything over spinach and added some black beans – YUM! Made this today, it was so delicious. I also added some grilled halloumi. The sauce is fantastic. Thank you for the recipe. I couldn’t make it with the sauce, but I cut up the zucchini and took the corn off the cob and tossed it on my grill pan along with salmon as a nice side dish, with the chickpeas. I seasoned with an herb grilling marinade (powdered) and my favorite Italian seasoning. This is an amazing recipe. It is now one of my favorites!! I made this last night and I was a 10!! So good! The garlic was a bit much, but my bf said I could Blanche the garlic before mixing it to take out some of the raw garlic bite. But once the dressing was on everything, you really couldn’t taste it as strong. I also made the chickpea/sweet potatoe/broccoli salad the other night and that one was also a ten!! These recipes are by far the easiest, and most flavorful dishes I’ve found!!!! I don’t suppose this can be frozen (just the grilled corn and zucchini, since I kept the roasted chickpeas and dressing separate)..? Can corn and zucchini be frozen once cooked, chopped and combined? Also, how long does the salad itself (corn and zucchini) last in the fridge? It’s best fresh, but lasts up to 2 days. I’m sure it could, but I wouldn’t recommend freezing it. I made this last night (indoors on my two grill pans) and loved it! The dressing was fantastic! Mine came out a weird olive green color (tomato + basil + purple basil I guess?) but tasted amazing! A lot like the pesto in the pea/arugula/sun-dried tomato pasta, which is another one of my favorite recipes. I added the roasted chickpeas and some toast on the side, and it was a nice light, flavorful summer meal. Everything I’ve made from your site has been a hit so far, I can’t wait to get your book! So yummy. I Just made it and everyone loved it, including my picky 11 year old. I would most definitely make it again! My mom and I loved this salad and it was the perfect grilled meal for the Fourth of July! The dressing was our the favorite part- because the recipe serves 3-4 and makes extra we’ve been enjoying the dressing on anything/everything all week. A few little tweaks to the dressing we added just for some spontaneity: a splash of balsamic vinegar, and because we love spice, cayenne pepper to taste. Definitely a new staple dressing in our house! This looks like fun summer food! Thanks for sharing!! This was delicious!!! Simple, quick but so flavorful. I didn’t add any maple or chickpeas. My son (a bit of a picky eater) liked the dressing on his tortellini. A great recipe that you could use on so many different things. Thank you for sharing, I’ve already planned to try another one of your recipes tonight. So so good. One of the best things I have made. The dressing came out very garlicky (granted I did use some big cloves), but it was SO good with the sweetness of the corn! Great recipe Dana! Great vinaigrette! I just made a similar one using cider vinegar and dried oregano instead of the lemon juice and fresh herbs (none in stock!) Using yours as inspiration. It was delicious. Thank you! Dana- your blog is my happy place! Thank you for all your delicious recipes and inspiration! I made this for a picnic and it was wonderful… I added a shallot and crushed red pepper flakes to the dressing. I skipped the chickpeas and added some toasted walnuts for crunch. Can’t wait for the leftovers! I haven’t made the whole recipe but have made the dressing twice and can say in all honesty that it’s my new obsession! The first time I served it with grilled veggies (eggplant, zucchini, portabella mushrooms and red onion) with pan seared italian marinated tofu over brown rice. It was so perfect and healthy! I used the extra dressing to make a pasta salad that even my 6 year old loved. The second time I served the dressing over grilled veggies and quinoa patties. It’s so versatile and easy and stores well. Thank you for sharing your amazing cooking! Just made this for dinner, loved it! Our dressing came out completely green though (I guess because of the basil?) Just a surprise as yours was totally red! Wondered whether you didn’t use the basil in the photos? Anyway, delicious dinner, will definitely make again, served ours alongside some baked sweet potato and chopped avocado! We made this and topped it on spinach for our main course. It was delicious! This is a great cookout salad. I followed the recipe exactly and everything turned out great with the exception of the chickpeas — they were somehow simultaneously soft and burned. Maybe the oven temp was too hot? The dressing is very fresh. I used basil and it turned out like a sun-dried tomato pesto. Tons of dressing leftover too. Delicious! 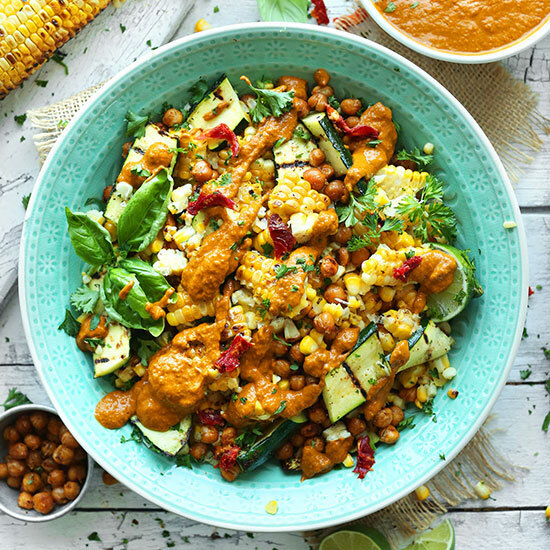 My husband and I made this but subbed canned corn for fresh and halloumi for the chickpeas – it’s the taste of summer! Yum! I made this last night using zucchini and herbs from our CSA and it was a huge hit! I used sun dried tomatoes from a jar and ended up using about 1/2 cup of water in the vinaigrette. It saved perfectly and the next day I tossed it with pasta for a quick and delicious lunch. Thanks for the recipe! This was really good! I tried it today. But made some changes because…I didn’t have an outdoor grill. I baked the corn, and fry / grill the zucchini using a cast iron grill pan. The dressing…well I didn’t find any sun dried tomatoes in the store and we didn’t have a blender either. So I subbed tomato paste instead and added gourmet pesto Vegenaise and the rest of the dressing ingredients and quick-whipped it by hand. I’m sure the original recipe tasted good, but this one tasted so good too!! I was surprised since I changed a lot of stuff. Thanks Dana for this great recipe! THANKS for the tip re: oil on the tomatoes – I added less and it was fabulous! I could just reach through my screen and eat ALL those crispy chickpeas…seriously, it’s surprising when I don’t eat them all before putting them in the actual recipe!! Fresh farmer’s market corn and zucchini is SO fresh right now, so this is the perfect recipe. I made this for dinner last night, along with some grilled chicken, and it was delicious! The flavors are so well balanced. It was fresh and ‘different’ from anything i’ve made before. This is going in my recipe binder for sure! Love sun-dried tomato dressing! I used to work at a mom and pop restaurant in Annapolis and they have a homemade SDT dressing. Loved it. I bet this dressing would make a great marinade for grilled or pan-seared tofu! Oh my, this looks completely delicious. I’ve been trying to tempt my boyfriend over to the veggie side. We’ll see how this sits with him! This looks so good! You have been on a very delicious recipe roll in June! Hi Dana I was wondering if this dressing is good on leafy greens? And what is your thoughts on replacing lemon juice with red wine vinegar? Thank you. I love everything about this salad! I’m sure it will be a hit at any cookout! Yum, yum, YUM. Beautiful recipe, Dana! That sun dried tomato dressing looks so good! This looks gorgeous! Love all the colors! Yum! Perfect for when I go to family BBQ and they are eating steak….this would pair nicely with my grilled portobello mushrooms! Oh man! This looks amazing!!! Love the salad bowl! Bring on the grilling season! Ps – loving your snaps, your new house looks beautiful! I think you’ve literally created the perfect summertime salad! This looks incred! This looks gorgeous, so delicious and very creative!! !